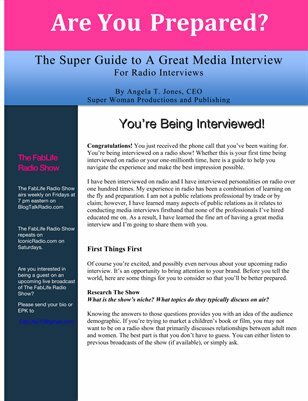 Super Woman Productions and Publishing guides you through your radio interview by providing tips that can assist anyone who is being interviewed on internet or terrestrial radio. This guide is for any novice or more experienced personality or professional who may need to represent their brand publicly on a radio broadcast. The guide includes tips to help you be a very interesting guest that will be asked to have future interviews.